How much do you use your diagnostic and analytical problem-solving abilities? Every person has a varying level of ability to apply this type of thinking, which is evident in the way we all solve problems differently. The three elements of Personal Style, Generalist/Specialist, Extroversion/Introversion, and Time Frame Orientation, and how these attributes fall on a continuum. There are positive things about falling in the low/mid/high range as well as challenges. The two very powerful problem-solving abilities, Classification (or diagnostic problem solving) and Concept Organization (analytical problem solving), and what it’s like to be in the low/high range on each of these continuums. 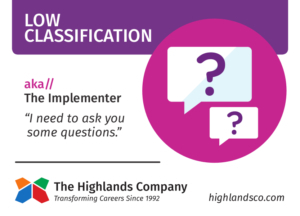 Now, it’s time to look at how Classification and Concept Organization influence each other…because they do. A lot. A person with this combination is especially influenced by his or her direct, personal experience. A high premium is placed on talking with or learning from someone else with experience in the topic at hand. Someone with Low Classification/Low Concept Organization could be the student who understands what it will be like to teach high school by student teaching, not taking university-level education classes. 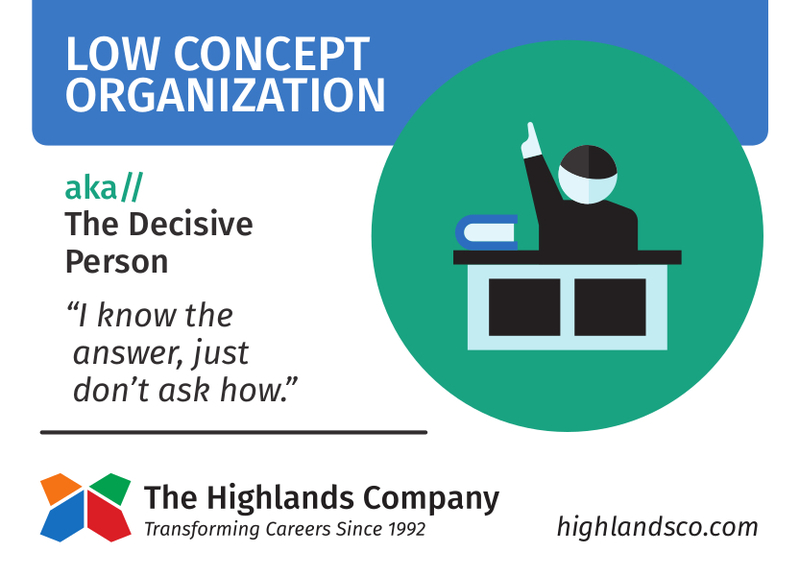 It’s the newly minted college graduate with a business degree that gets into a two-year management training program who, through the experience rotating through all of the departments at the company, knows Human Resources is the best fit. Initially slow to jump to conclusions or solutions, with experience this type of problem solver can become the fastest to find a solution once up on the experience curve. Someone with this natural ability combination is a diagnostician. If you’re familiar with the medical TV series House, the diagnostician IS Dr. Gregory House. House’s ability to take seemingly unrelated pieces of information and pull them together to solve (i.e. diagnose) the medical case is the foundation of this combination. Also typical of this combination is his impatience with others who don’t see things as quickly as he does. Coming to conclusions quickly is the upside. More difficult is providing the explanation of how he got there – the steps involved or the train of logic necessary to communicate to others how he knew. He’d need Concept Organization to do that. Real Highlands clients with this combination consistently report feeling “at home” in fast-paced environments, having a strong need to problem-solve, feeling impatient when working with others that don’t “get it” as quickly as they do, and are frustrated by having to build explanatory communication skills. Naturally logical in problem analysis and thorough in ensuring all things have been considered, those with a High Concept Organization and Low Classification combination can be slower to arrive at conclusions. 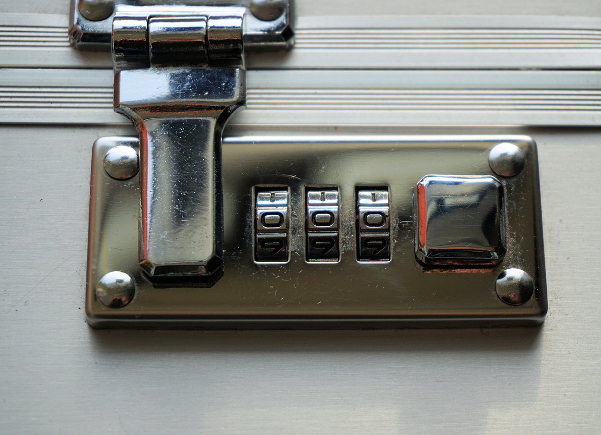 The hallmark of this type of problem solving is a well-organized series of steps, or logic track. 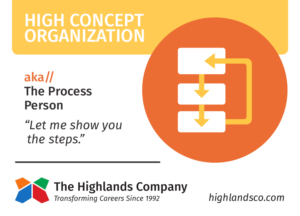 This internal organization can result in prioritizing, planning, or creating processes or systems to accomplish work. And, it’s the foundation for clear communication necessary in explaining information to others. This type of problem solver can feel pressure if required to respond on-the-spot to a problem not yet contemplated, needing a more moderate pace to allow for their analysis. The financial advisor that has the patience to explain retirement strategies to clients is exhibiting this combination and would likely feel less comfortable in the role of working on the floor of the New York Stock Exchanging trading every day. Here we have someone whose Convergent Reasoning abilities don’t sleep. These strong drivers need an outlet, and if they’re not used on the job, they should be used outside of work. It will take a conscious effort for this problem solver to find ways to dial back his or her continuous consultative reasoning abilities. 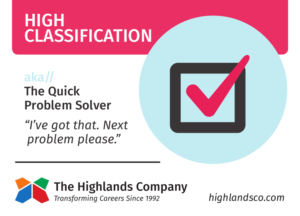 High Classification means quickly sizing things up and arriving at conclusions and high Concept Organization means being able to explain the logic track supporting the conclusion. So, in many cases, these two abilities work well together in situations requiring quick solutions and helping others to understand. Take a lawyer who sizes up the facts of a case, works with curve balls along the way, and must communicate with clients, other lawyers, and judges their rationale. Or, consider the organizational consultant that diagnoses employee turnover and must develop new methods to attract and retain talent. One potential challenge facing this problem solver is too much thinking (too much contemplating, too easily seeing all the pros and cons simultaneously), which can result in NO decision or feeling stuck. For example, the high school senior trying to decide between an overwhelming number of college options. 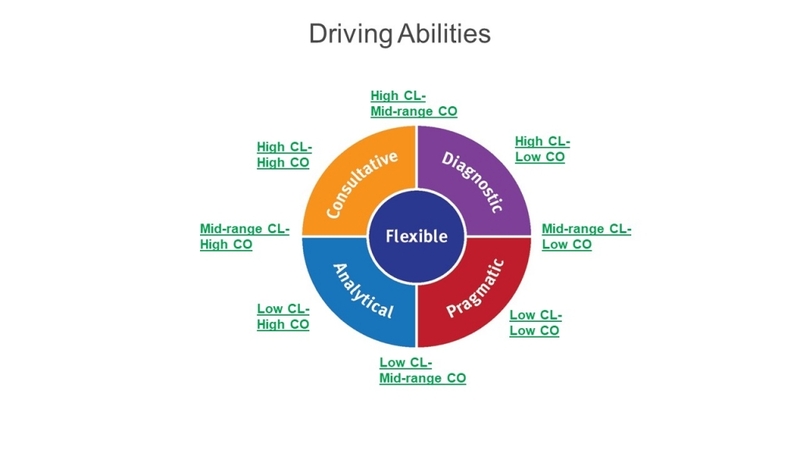 The most blended style exists for the person who is in the mid-range on both Classification and Concept Organization–a very flexible problem solver. The upside is the natural ability to use any of these problem-solving styles. The potential downside is not understanding why others cannot flex as easily. 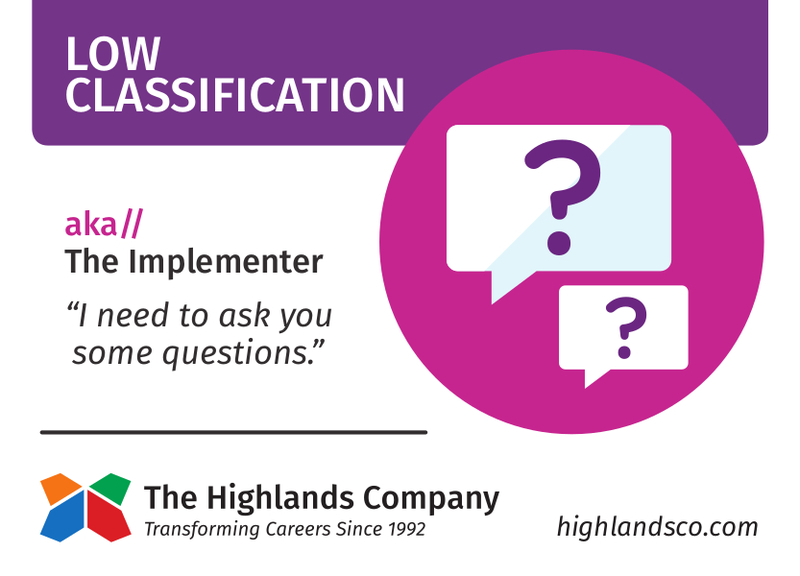 Where do you think you land on the continuum of Classification and Concept Organization? Take the HAB to find out!